← The Earl of Brass is IndieReader Approved! One of the members of my Facebook author page asked if I would do a post about my writing process. After I saw it, I sat back and scratched my head. What was my writing process? Like many things, when you live with it, it isn’t nearly as obvious as it is to others. As with all writing, it begins with an idea. Sometimes it comes as a smattering of dialogue or description while other times it comes as a topic or idea. For The Earl of Brass, it began with the idea of a man needing automaton parts in order to survive, but this rapidly evolved into a man with a missing arm who needs a prosthesis. In the beginning, I typically free write and put down anything that comes to mind. Sometimes it becomes the first chapter of a novel while other times it gets completely rewritten or discarded. Once an idea beginnings to take form, I make an idea map or an outline of what events will happen in the coming paragraphs. For flexibility’s sake, I usually only plan five or so chapters ahead at any given time. Typically, my characters are wayward and do what they want, so I need to alter my plans to fit them. Forcing an agenda on my characters never goes well. 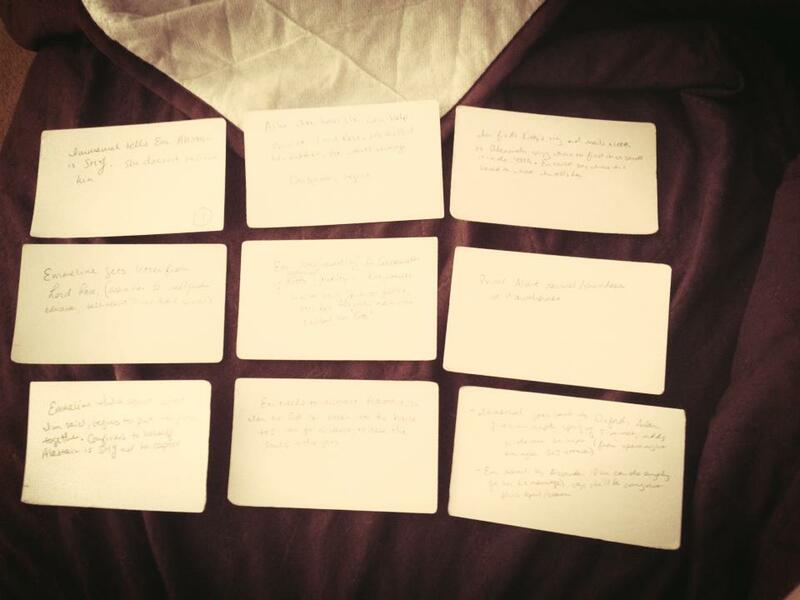 Sometimes when I have ideas but am not sure what order they should be in, I make index cards and lay them out. I will move them around and ask my best friend/beta reader and see what she thinks to ensure it’s logical to others. Once the outlining and plotting is done, I tend to sit at my computer and do everything but write. I play on Facebook, I write escapist blog posts, bounce ideas off my friend/beta reader, and do research for the upcoming chapter if need be. When writing stories in a historical setting, you would be surprised by what weird things you need to look up. One of the things I have found to work lately is to write (I typically get a lot done late at night in a sudden blitz), and then go back the next day before I start and do a bit of editing over what I have of that chapter thus far. Typically this is just rewording and rephrasing sentences and minor edits because sleepy Kara makes a lot of dumb errors. This also allows me to get reacquainted with what I wrote the previous day, and using that string, I add on and begin to write more. This eliminates the cold start of writing that tends to lead to me staring longingly at the computer even if I have an outline of what I want to accomplish. Usually when I finish a chapter or section, I send it to my beta reader to see if she thinks certain areas need clearing up or altering. This is basically my process when I write. i repeat it for each chapter with little variation. I’m not going to go through my editing process because I already wrote a post on that, which can be found here. Eventually, I’ll write more on the process I go through when publishing, but that will probably be done closer to when The Winter Garden is coming out.